Ashcan copies of Golden Age comics are, in a word, rare. I don’t see them pop up too often in auction houses, and frankly I’ve maybe seen one in person throughout my years of buying old books. In tonight’s Jon Berk auction at Comic Connect, a Flash Comics #1 Ashcan will be going to a new home tonight (sadly, not me). This ashcan is an important one for several reasons. For one, Fawcett wound up not using The Flash title due to copyright reasons. They also couldn’t use the name Capain Thunder, thanks to another copyright issue. As we all know, this book became Whiz Comics starring Captain Marvel. In fact, you can read all about the fight for the Flash title here, as we have covered it before! 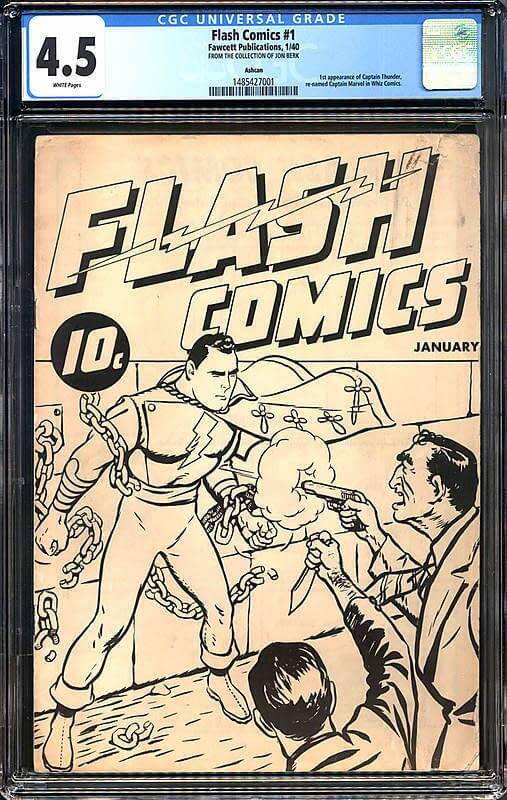 This Flash Comics #1 Ashcan is a CGC 4.5 out of 10, but boasts white pages. This is the perfect item for any Captain Marvel fan, or just GA collectors in general. I have a feeling the book will break $10K, so if you’re interested, keep your eyes on the prize! Good luck, and may the bidding be ever in your favor.